DenamiCON featured keynote speaker Paul Roetzer, speaking about Artifical Intelligence and the changes in marketing. 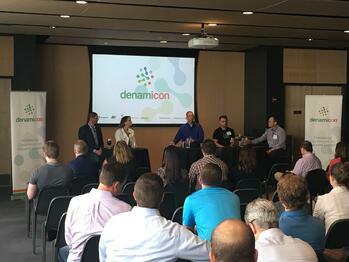 Forward thinking, marketing artificial intelligence insights, Surly beer, an intriguing panel, accompanied by a night of networking is a simple way to give an overview of DenamiCON - the Twin Cities’ Conference on Inbound Growth. 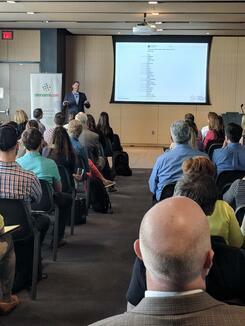 PR 20/20 CEO, Paul Roetzer, kicked off the afternoon with, “Marketing in the Machine Age - the Path to a More (Artificially) Intelligent Future.” Roetzer took us back to New Years Eve of 2007 showing a list of tech that didn’t exist. There was no Snapchat, no Instagram, and most importantly, no Find My iPhone. Roetzer shared that most people are already using AI, and they may not even notice it. If you’re one of the 2.19 billion active users on Facebook, you’re using AI. If you’re using predictive text on your phone or computer, you’re using AI. If you’re talking to an Alexa, Apple Homekit, or Google Home, you’re using AI. Although these may seem like “small” advancements, they’re opening the doors for major AI advances in the future. “My daughter is six. I don’t believe she’ll ever need a driver’s license.” Roetzer said when talking about autonomous vehicles. Although the future of AI is one we cannot be exact about, Roetzer believes it’s going to change the way we operate. As complex as AI seems, Roetzer left the audience with ways they can start using and preparing for the future of AI. Start with your existing marketing technology and explore the potential of emerging AI solutions. After Roetzer’s presentation (and a drink refill) the panelists were ready to share their experiences and thoughts on AI. An opening question was posed for the panelists to define what AI is, and what it means for the average business, along with how they’re defining it to their customers. VP of Consumer Insights & Technologies at Ciceron, Kristin Findley said that there’s no one right way to define AI since it’s so robust, but when she’s speaking to her customers about it, she simplifies AI as teaching machines to make faster, smarter decisions using data. Co-founder of Equals 3, Scott Litman said, when we think about the definition of AI, we like augmented intelligence rather than artificial intelligence. We’re not creating sentient beings that think for you but we are able to do more, more effectively in less time. Co-founder of Aftercode, Josh Cutler had an answer that aligned with Findley stating, AI is hard because the goal posts constantly move. The best way I’ve heard it explained is teaching machines to do things that we think are hard for machines to do. Right now it’s about teaching machines to do things based on huge amounts of data. The conversation continued and our panel shared their thoughts on the future, along with how they’re continuing to develop strategy and implement AI throughout their businesses. Simply put, DenamiCON was a information-packed day filled with AI insights, great food, and craft beer. Did you have to miss out on the event? We’ve got you covered, check out Paul Roetzer’s keynote as well as the panel discussion. See everyone in November for our next DenamiCON.